Part 3 of this article series: “Best Center Console – Make or Break Features”, we will be addressing Quality of Manufacturing which is another key aspect in building the ultimate center console vessel. As we previously discussed how imperative the engineering factors play in this process, the temptation exists to cut expenses in the attempt to become more profitable. This mentality is simply a futile mistake that will cost you much more in the long run when it comes to reputation, longevity and value of your boat. At Bahama Boat Works, cutting corners in manufacturing quality is simply not an option. With that being said, here are some very important things to look for or ask your boat manufacturer when contemplating the boat for you. Unfortunately, these standards of construction are rarely followed in the boating industry. In hand applied fabrication, it is much easier for the laminators if they simply flood the fiberglass fabric with resin in order to work out any trapped air, leaving behind excess or even pooled resin. As a result, the fiber to resin ratio drops far below 50%, with the strength & durability of the panel involved suffering in the process. Lack of careful attention by the workers can also leave air voids in the laminate, with similar results. In vacuum infused construction, in spite of employing lower viscosity resins with inherently weaker physical properties than higher viscosity hand lay-up varieties, dry areas in the laminate can result which can severely compromise the strength of the structure. Bahama Boat Works does not follow or allow any of these practices. It employs only careful hand lamination techniques using higher viscosity/high physical strength resins, which allow the close inspection of every layer, and insists that its lamination department adhere as closely as possible to “advanced composites” standards. This insistence is guaranteed by tight quality control supervision and inspection. Sub-standard components are never accepted, and are rejected rather than applied to the vessel’s construction. 1.) Orthophthalic: Generically known as “boat resin”, this is the least expensive resin in the polyester family. It has also been around the longest. Many chemical improvements have been made over the years. Although it is commonly assumed that all polyester resins are “water proof”, in reality they are not. Orthophthalic resins display hydroscopic behavior. That is to say that they can slowly absorb water. One result of this tendency that has plagued the FRP boat industry is hull blistering. Bahama Boat Works does not use ANY orthophthalic resins in ANY of their components, above or below the water line! 2.) Isophthalic: Though more expensive, this type of resin displays much better physical characteristics than orthophthalics. Not only are they physically stronger, but they also have much higher corrosive resistance and much lower water absorption than orthophthalic resins. Some isophthalic resins actually have FDA approval for the storage of potable fluids. Bahama Boat Works uses premium Aropol 7121 T-15 isophthalic resin exclusively in above deck components. 3.) Vinylesters: This family of resins are chemical hybrids of epoxy and polyester resins. They are the most expensive members of the polyester family, but they have the highest physical strengths as well as the highest corrosive resistance. For example, vinylester resins are the EPA standard for the underground storage of E-10 gasoline! They are absolutely waterproof! 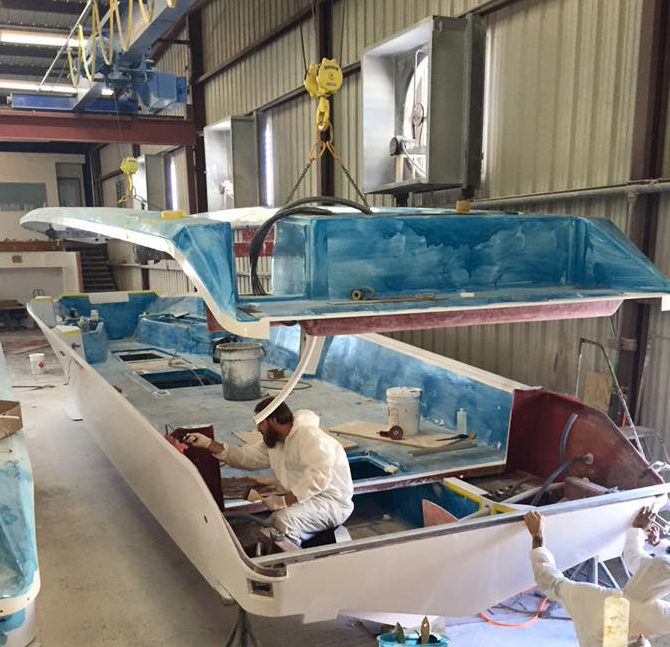 All hulls produced by Bahama Boat Works are fabricated using ONLY premium AME 6000 vinylester resin – not just in the outside skins of the hulls like most high-end boat manufacturers, but throughout the entire laminate schedule! This practice is very rare in the industry. Both types of resins used in Bahama Boat Works products also display excellent secondary bonding performance, and all structural bonding of components is performed with vinylester adhesives. These are critically important features in hull quality and durability rarely seen in the industry. Not only are hulls produced this way as strong and durable as possible, but they are also impervious to hull blistering when stored in the water. It is counter-intuitive, but the wettest portion of a boat hull is actually the bilge – not the outside that is in direct contact with fluid water. The reason why is the fact that the bilge is constantly exposed to water vapor, which has a much smaller molecular structure than water fluid. Smaller molecules allow easier passage through semipermeable membranes. The use of only vinylester resin in a boat hull guarantees that moisture in any form cannot enter the laminate from any direction at any time in its life span! There is one other factor pertaining to resins that is worth a second mention: That is the viscosity of the resin employed. When resins are produced with lower viscosities, such as those intended for infusion, they tend to automatically display lower physical strengths. 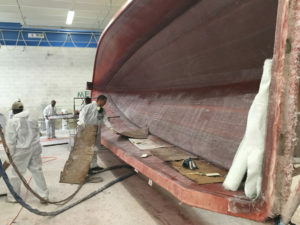 While the “vacuum infusion” of boat hulls can be an attractive manufacturing technique when it comes to efficiency of production, a simple comparison between the physical strengths listed on the “technical data sheets” of infusion resins and non-infusion resins will tell the true story. In order to build the highest strength to weight structures possible, Bahama Boat Works also employs “sandwich cored construction” on its transoms, hull sides, decks, hatches, consoles, hardtops and other vessel components. This type of construction results in panels that for engineering purposes are two dimensional I-beams; much stiffer, stronger and lighter than single-skinned panels. 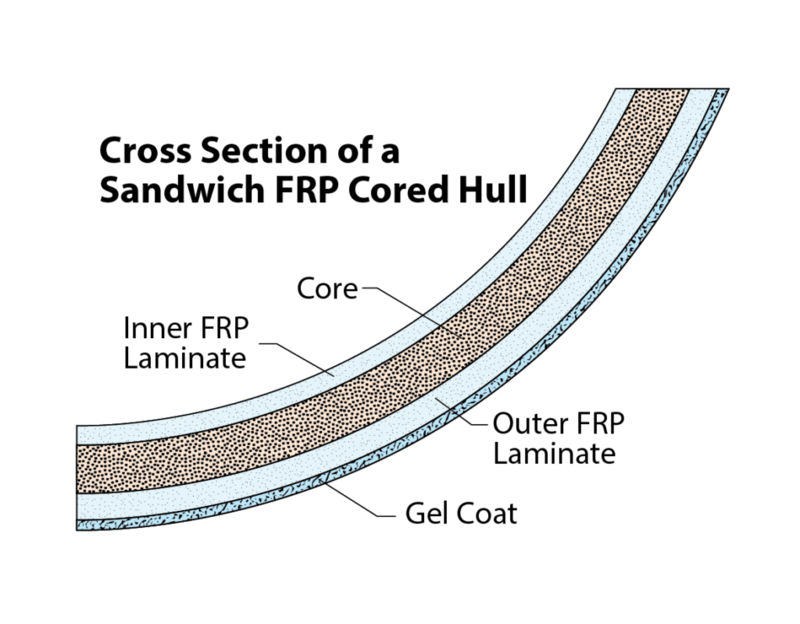 Hull sides feature Corecell foam, which is a semi-rigid/semi-elastomeric product that has a “memory”. In other words, hard blows do not permanently crush the core. The result is a sandwich panel that is much more durable during impacts over its lifetime than a rigid cored product. Corecell absorbs more energy than other core and is much more resistant to being permanently deformed. 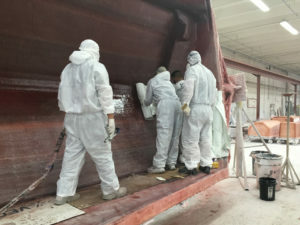 All Bahama Boat Works, hulls also feature transoms cored with 30 pounds per square inch density Coosa board, which is a high density foam with fiberglass fabric infused in it. The result is transoms that are lighter than those that are wooden cored, with higher crush characteristics than wood units, but without the potential for rot. The mounting of three or four outboard engines of any size or make presents no structural challenge whatsoever on a Bahama Boat Works hull! 1. Fully mortised console door locks: Bahama Boat Works is unique in its class for its use of proper built-in door locks. Normally, only yacht builders go through this much trouble to secure a door! 2. Compression latches are used on all hatches to prevent rattling. 3. All hardware possible, such as latches, hinges, fuel fills, hawser rings, cleats, rod holders, etc. are blind fastened with studs from the back to prevent corrosion in exposed screw heads. 4. All tubing on hardtops is heavy-duty, schedule 80 aluminum for long-term durability. 5. Wiring harnesses are neatly organized & fabricated to military specifications. Due to the complexity of Bahama Boat Works’ product line, the hardware list goes on and on, but the theme is really quite simple: Use the very best components available, no matter how much extra difficulty it might pose. This applies to every single item used in construction. At Bahama Boat Works, quality is our first purpose!